Community members visited Fellsmere Elementary during the Moonshot Tour of Gratitude in November, giving Moonshot Moment supporters a firsthand look at the work being accomplished through the collaborative efforts of The Learning Alliance, Moonshot Community Action Network and the school district. Fellsmere principal, Ramon Echeverria, likened the staff at the school to that of the doctors at the Mayo Clinic. “You know that you're dealing with the best of the best at the Mayo Clinic. They practice team medicine.” As the “head surgeon” at Fellsmere Echeverria explained that with education like surgery there's not just one doctor and there are many steps that have to be made before that operation takes place. Before heading into the classrooms, guests met with Fellsmere staff who were able to give insight into why The Learning Alliance's support model was so successful. The students served at Fellsmere Elementary School create a unique demographic with 100 percent of the children receiving free or reduced-cost lunch. The school population is 97 percent Hispanic. “Wherever poverty occurs, language is an issue,” noted Echeverria. Fellsmere is considered a “Deep Dive” school, a school identified by the school district as needing the full cadre of support services offered by The Learning Alliance. 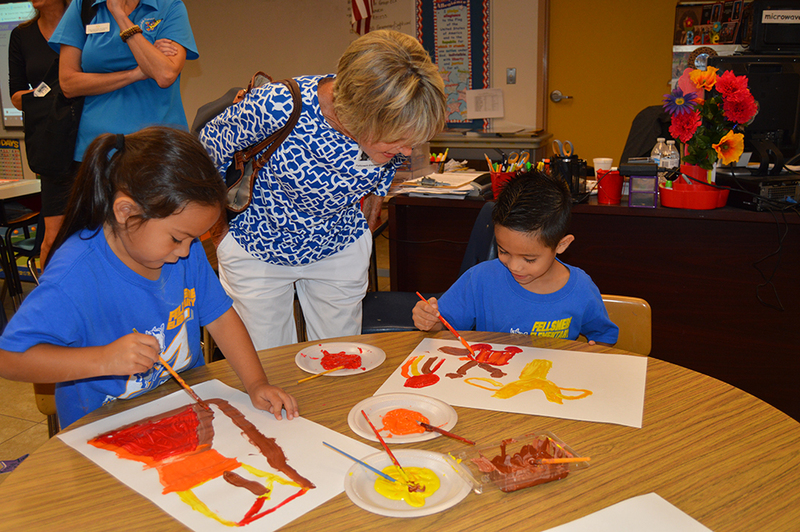 Last year, Fellsmere became a Moonshot Academy school with a twice weekly, literacy-based, afterschool program. The Academy school means that second-grade students identified as not reading on grade level receive one-to-one and small group reading tutelage through a program designed to complement daily classroom instruction and align resources. As a Deep Dive school, the TLA also funds an interventionist for K-1, 2nd and 3rd grades, and a K-2 Moonshot Coach. According to Echeverria, these programs and personnel have made a significant impact on student improvement. More than 50 percent of the students at Fellsmere have increased testing scores, and 64 percent of those students scored 30 points higher than the last test. “Our data shows that their growth has been immense, and they are just soaking it all in and doing a fantastic job,” said Echeverria. After touring kindergarten through third-grade classrooms, guests gathered to discuss their observations and had the opportunity to ask questions about current and future programming. Key players, including community partners, school district representatives and The Learning Alliance were on hand to demonstrate that it, indeed, is a community-wide effort. According to Echeverria, it's this partnership and open lines of communication that have made the difference. School District of Indian River County Superintendent Mark Rendell introduced Kelly Baysura, SDIRC executive director of elementary programs, noting Baysura has been tasked with supervising the four “Deep Dive” schools and as such has worked with the schools to provide a “scaffolding” for low-performing students reach their goals instead of lowering the target. Chief Keith Touchberry explained the benefits of the Cadets and Kids program. Students are paired with cadets from the Criminal Justice Institute Basic Recruit Training Program at Indian River State College. The “kids” and “cadets” support each other throughout the school year as they both work toward taking state exams in the spring. Last year, 100 percent of the kids and cadets passed their assessments. After such a successful first year of the program, it has expanded to include all third-grade students at Fellsmere Elementary. The Moonshot Community Action Network plays a significant role in the success according to Tiffany Justice, School Board member. “Not only does The Learning Alliance provide support but has created a framework in the community giving different organizations space to help in schools,” she noted. “What happened here at Fellsmere, what is happening at Indian River Academy and at Vero Beach Elementary – it gave us hope that every kid can succeed if given the time and the extra money and right training,” said Ray Oglethorpe TLA chairman. The Learning Alliance has committed to increasing the number of schools served from five to twelve and doubling the number of Deep Dive schools from two to four. “Numbers are one thing, but behind all those numbers are kids, real kids. We're making a difference in their lives to double the number of kids who can read proficiently by the end of third grade,” added Oglethorpe. At The Learning Alliance, our work is predicated on the question – What does it take to achieve 90 percent literacy by third grade such that we create literate, compassionate, creative citizens who will improve our world? The Learning Alliance is a catalyst for innovation and collaboration, supporting the Moonshot Moment 90 percent literacy transformative goal by arming front-line educators, parents, and community leaders with the tools, knowledge, and support necessary for success. Through innovative, evidence-based approaches to teaching and learning, we empower teachers to transform children’s lives. Through partnerships with the School District of Indian River County, Indian River State College, community leaders and civic youth organizations in our community, we hope to create local solutions that can serve as a model for the nation.